This one pot balsamic chicken recipe is one of my favorite 30 minute meals. 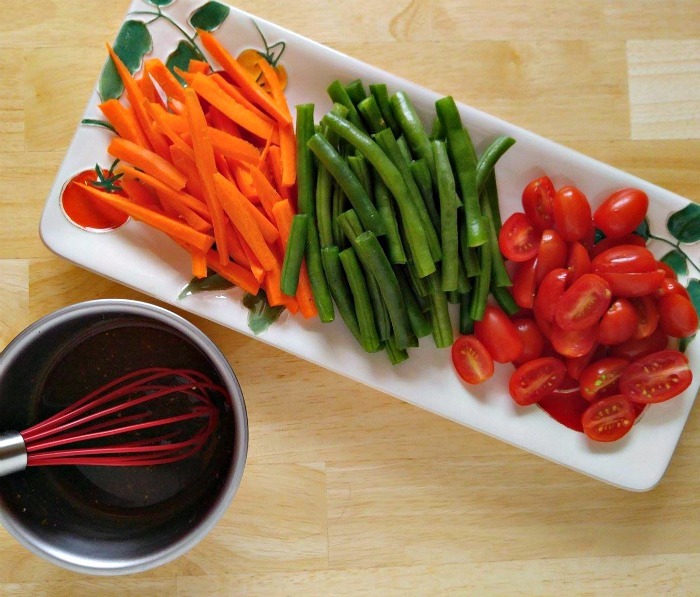 Tender and juicy chicken is flavored with a tasty balsamic sauce that brings the vegetable to life. 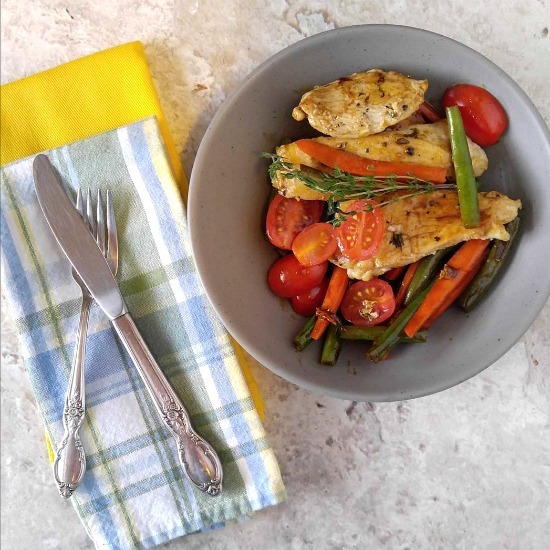 And even better, this delicious chicken recipe is a one pan meal, as well! We are all busy and most of us don’t have hours to spend cooking each night to feed our hungry families. Even though blogging is my full time work,so I work from home, I still find myself typing a new blog post, editing photos, or sharing my posts on social media when the dinner hour rolls around and my family asks “what’s for dinner mum?” That is when a quick and easy dinner recipe really comes in handy for me. One pot meals are the tastiest of easy recipes. The flavors really get a chance to develop from this type of cooking and clean up is a breeze later. This dish is made in four easy steps. Brown the chicken in olive oil. Add 1/2 of the sauce mix. Stir in the beans and carrots with a tiny bit of vegetable broth. Add the rest of the sauce and fold in the grape tomatoes. You really can’t get any easier than this! But don’t let that fool you! 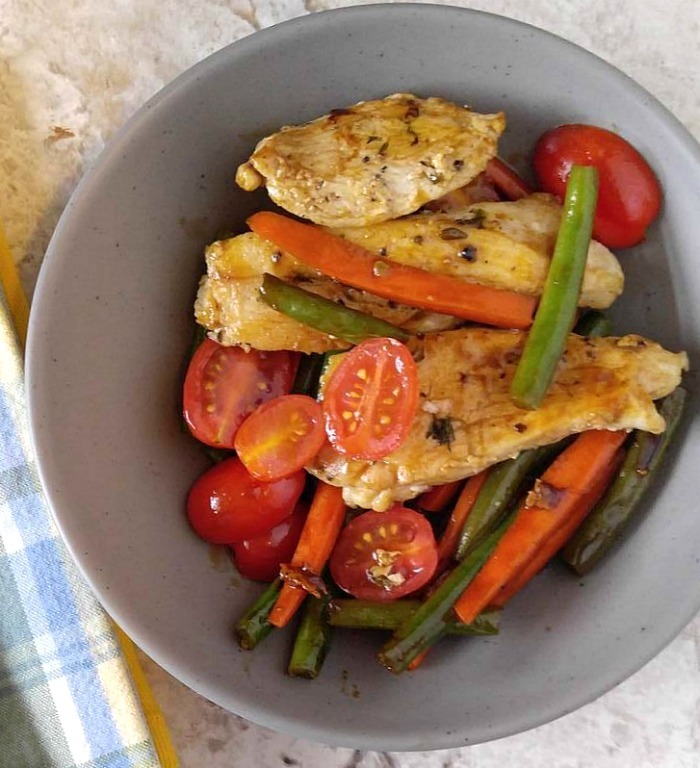 The taste of this One Pot Balsamic Chicken and Vegetables Recipe is divine. It has the fresh taste of healthy vegetables and a lovely sauce made with cumin, LIght Italian salad dressing, balsamic vinegar and honey. It is mild and neither too spicy or too sweet. 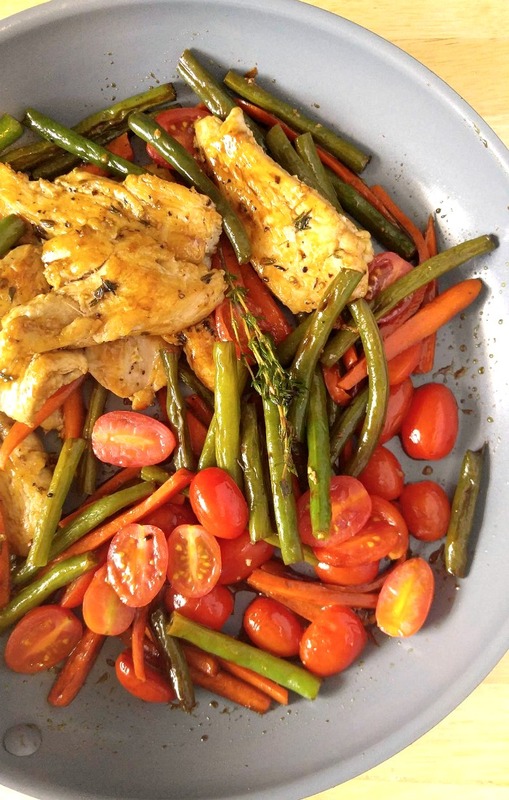 Just a perfect way to dress a simple dish of chicken and veggies. I love the bright colors that permeate the dish, even after it is cooked. Each bite gives you the fresh taste of just crisp veggies, tender chicken and that lovely sauce. Your family will definitely want this one again. I love that this dish won’t break my calorie bank. 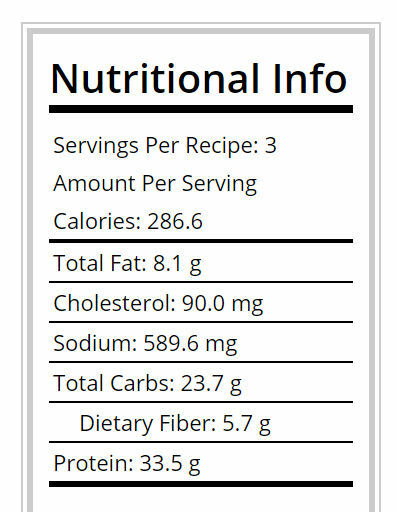 With the New Year comes a new healthy eating plan and this one fits in very well to that at just 286 calories per serving. Also for those on a gluten free diet, this One Pot Balsamic Chicken and Vegetables is gluten free, as well. For another tasty combination of flavors like this, check out this balsamic chicken and mushrooms recipe. It’s ready in 30 minutes and tastes amazing. For more healthy recipes, please visit my Pinterest Healthy Cooking Board. This one pot balsamic chicken recipe is a 30 minute meal. 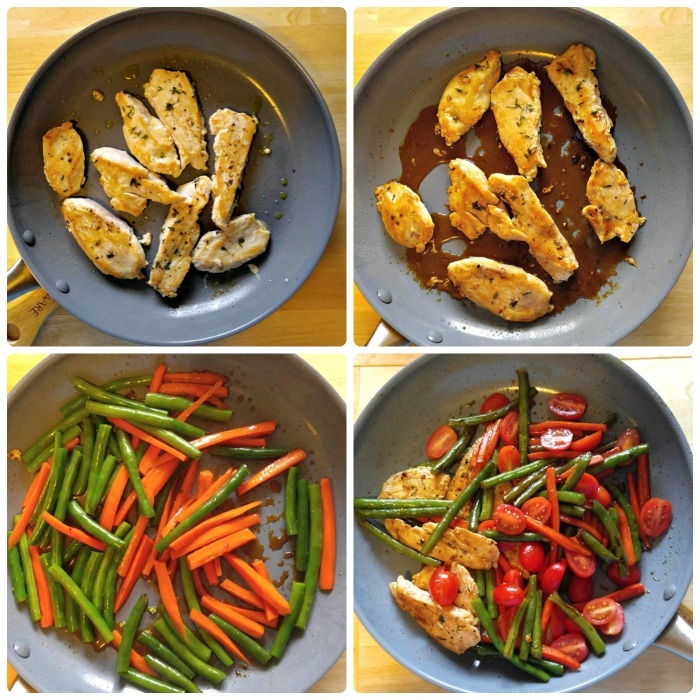 Tender and juicy chicken is flavored with a tasty balsamic sauce that compliments the vegetables beautifully. Combine the salad dressing, balsamic vinegar, honey and cumin. Whisk and set aside. Heat the olive oil in a non stick pan over medium high heat. Season the chicken with fresh thyme, sea salt and black pepper.. Cook the chicken evenly in the pan about 6-7 minutes, turning once during cooking. Add half of the dressing to the skillet and move the chicken around to coat it well. Transfer the chicken to a plate but leave the sauce in the skillet. Pour in the vegetable broth, add the green beans and carrots to the skillet, season again with salt and pepper and cook, stirring often until they are tender crisp - about 6-7 minutes. Place the veggies on the serving dish with the chicken.